OMG you did it, with all the beautiful pictures and how awesome it looks!!! That is great and awesome post and thanks to your I loved making these cheese and love those molds too. They are all too beautiful to eat! You are an amazing cook. I use tablets because I can find them in my local store. I have friends who use liquid rennet and they have great results too. I am not sure what the equivalent amount is though. I live in a very mild climate so I can make gbejniet any time of the year. But I do find it takes longer to dry them in the winter as well, so I usually just eat them fresh. It is 98 Degrees Fahrenheit…which means it is slightly warmed. I use it as it makes the gbejniet more solid. I know some people have tried the recipe and not use the powdered milk with good results. I just don’t like risking it. I found you. First would like to say I love your store it is very nice. 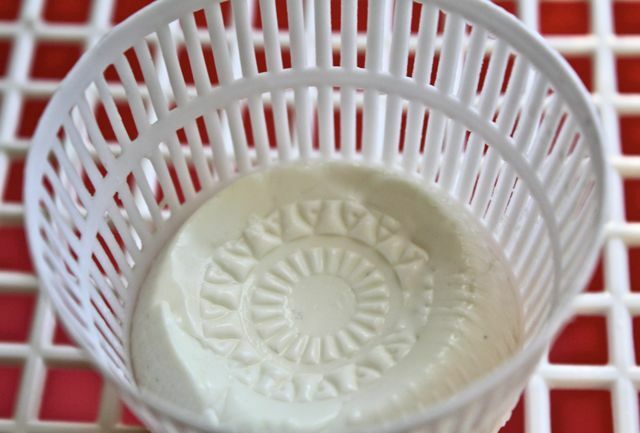 I seen on Georgina website some cheese moulds baskets. You said you sell them. I would like to buy some from you. How much are they ? I would like to get 50 of the small ones. I thank you for your time and hope to hear back from you soon. 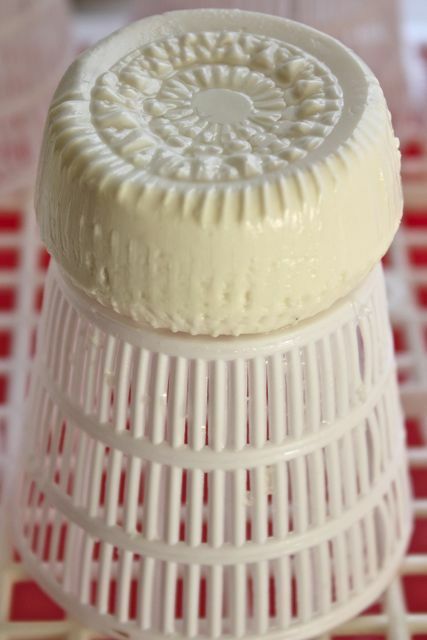 Actually I do not own a store and am just a stay at home mum from Malta living in the States and missing Maltese food very much:) But even though I do not sell these cheese baskets, I know where you can get some in Malta. Hello! Georgina, I wanted to thank you for your help. Mr.Vell did get in contact with me. He told me how much the baskets are. I am not sure how to pay for them. He may be having a hard time understanding me. I think. I REALLY LOVE your website. I am looking for someone to do my website over. May I ask what state are you in ? I said I do NOT sell them. I’m sorry for the misunderstanding! Try the BULK BARN or look for foods that are wrapped and packaged in something similar to the baskets. I make my own cream cheese called Lebaneh in a small material pillowcase shape once it drained I turn it into the yogurt containers or jar it in oil. What about the garlic net pack that they sell at all the stores in toronto. It has holes and you can put it on a grill tray to drain. Hope this helps. I’m maltese too and live in Oshawa, Ontario. 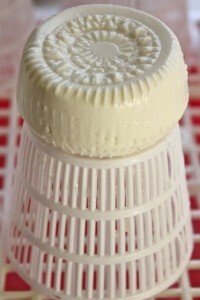 Hello simon, I am trying to get these little baskets for Maltese cheese I am I. Australia. Do you have an email address and will you ship them out to Australia. I only have a few reed baskets from my grandmother but I’m desperate to get some plastic ones. I have been looking on line for ages but can’t find them. No, I’m afraid I don’t. I had mine sent over from Malta. Wow I love your website it took me back to my childhood all the delicious foods especially the gbejniet. 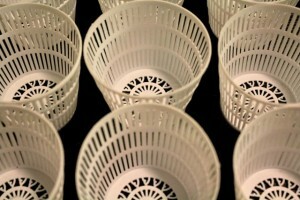 My mother used to make them and she had those little baskets and she always said I can have them when she passed away. I did not end up getting them when she passed away in 2001 and I have been on the look out ever since for some. I live in Australia, I have never seen them here. If you wouldn’t mind letting me know where I can get some I would appreciate it very much because I would love to make these. Today is a very happy day for me because I just happened on you site while I was surfing. You have done such a great job with you site. I haven’t been able to check out all the things on here yet but will do in the next few days. Oh wow, Emanuela…if I made you happy, you just made my day with your wonderful comment! For some reason, word press did not alert me that I had a message so I was extra happy to find your lovely message here. I’m so glad these recipes have brought back so many memories for you. I still have family in Malta, so that is how I got my baskets sent. A Simon Vella also happened to come across my website and he said that they sell baskets at his store but I’m not clear if he ships anywhere in the world, or if he stays local. Otherwise I don’t know of anybody who ships these from Malta. If you get in touch with Simon and are successful in getting some cheese baskets sent over, it would be great if you can let me know, cause I would like to be able to spread the word where to get them as I do get questioned about these every so often. Thank you so much for encouraging me on my website. I hope you get to try some of these recipes and are happy with the results. I am a Maltese at heart even though I’ve been away from the Island 20 yrs!! Times just flies! Came across your website and I must say you are doing a great job “spreading the word”. There’s a maltese shop in Brisbane Australia that sells baskets and maltese food. Google it. Maltesefoods. Thank you so much! Your website is wonderful. After 32 years that I have lived here I still get a wonderful feeling when I reminisce the taste of all your items. Time for a visit! I think that’s how it’s spelt. Mmmm love gbejniet.. Wish I could cook. Looks good on the website. The good thing about this recipe is that it hardly needs any cooking:) Go ahead, try it…you won’t be disappointed. I have come across your name on the I Love Maltese Food forum and now here. I was searching for an address in Australia where to buy qwieleb. Apparently there is a company in Brisbane who sell the plastic ones. Before I start making my cheeses, I would appreciate hearing what you use for sterilising your gbejniet making equipment? 1. How do I sanitize my equipment? Surface areas – We recommend using a food grade sanitizer. 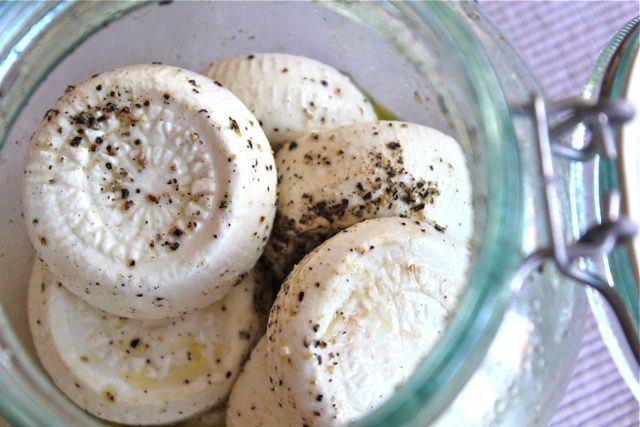 Before you begin to make cheese, wipe down your counters with this solution. Utensils – Sterilize your utensils in boiling water for 10 minutes (or run them through the dishwasher on the hottest cycle). 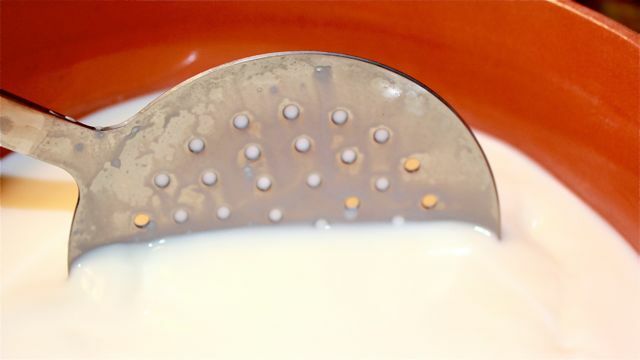 Pots & pans – The residue on your pots is called milk stone, which builds up over time. The best way to find a cleaner for this is to do a search for milk stone remover online. Also, if you have an agricultural store nearby, ask them for an acid based detergent for dairy use. Normally, alkaline based dairy cleaners are used to remove fat and proteins but the calcium deposits of milk stone need an acid cleaner. Most dairies use the alkaline cleaner every day and the acid cleaner once a week. 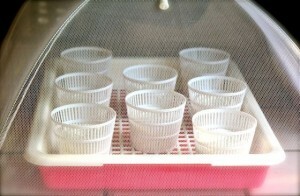 All I use is very hot water and reg detergent and make sure that they are properly rinsed and dried. Don’t put the plastic molds in the dishwasher, they don’t like it 🙂 Hope this helps. I have left the milk for three hours. Is it supposed to be like milk or should it be going a little hard. Also do I store in the fridge overnight? After putting in the rennet and leaving it for three hours, it should have hardened. If it didn’t, then check to see what type of milk you are using. It should not be Ultra Pasteurised as that will not let the milk coagulate. It’s best to use non homogenised milk. It’s best to leave in the fridge overnight, but I have left it out because I don’t always have room. I hope this helps. I have tried this recipe three times now but to not luck. I have used unhomogenised and unpasturised milk but cannot get it to curdle after leaving it cool at room temperature for three hours. I have followed your instructions making sure I sterilise all equipment, I have skim milk powder as per the recipe, I heat to 98 degrees, add two rennet junkets which have been dissolved into the milk and stir and leave cool for three hours. Can you please advise if there is anything else I am doing wrong. Thank u lee. Yes I have been doing 98 degrees as advised in the recipe. Are you sure lee as I have run the degrees by Georgina a few times and she has never corrected the temperature ? The recipe is in fahrenheit. 98 degrees fahrenheit is 37 degrees celsius. I am going to try this, Georgina. You know, I think I remember going to the Colonial Store with my mother years and years ago. I am compiling a shopping list for my brother for his next visit. I am putting the Gbejniet. baskets on the list, and seeds for the courgettes! Possibly a lump of raw dough from a baker! Do you have any other ideas to add to my list? He brings me capers but they are too vinegary for me. You might wonder why I just don’t go myself. I live in Tokyo, and Malta is not easily accessible. You have to fly somewhere in Europe or UK and change planes, and I can’t take enough time off work to do all that. Oh you live in Tokyo!! How cool!! My son wants to come and do a year of college there next year! He is learning Japanese language and Japanese Folklore this year and is loving it. So I’ve been thinking and since you remember Colonial Store from years ago, I wanted to let you know that the store is still in Valletta and do ship the gbejniet baskets to you…you just have to email them and you can find them on fb. Since Malta joined the EU, they have products from all over Europe…delicious Italian pastries etc…have you ever been to Italy? The other thing I’m thinking is that you might need to get the Rennet Pills sent to you as well. And wow a lump of dough…how clever!! That’s an awesome idea! Do let me know if it all comes off! I am making the ftira recipe with some of my own tweaks and I only make it as regular bread loaf. I’m still fiddling with the recipe but I have made three batches so far each one better than the last. I’m very pleased as next to gbejniet Malta bread is my fave, I lived on it when I last visited Malta. 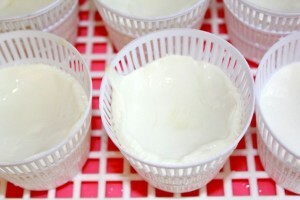 The gbejniet I make from kefir cheese that I make at home from which I get whey for my bread. I take photos of each batch as one of my friends is baking this bread as well. I don’t think we can replicate the Maltese bread exactly since the yeast in the sourdough starter is native to where you live, mine is North Western Ontario not Malta but it’s still good and I’m surprised that it’s pretty close to what I remember. Hi Vicky…sorry for the late reply as I’ve been busy baking away during the holidays. I don’t need to make cream, it’s just another thing I can make at home…just like yoghurt. If I can make it, then I will (that’s my motto:) Next I want to try making clotted cream as there is nothing like the real thing here where I live. Thank you so much for your message…I enjoy reading all the different ways people make home made goodies. Hi thanks for your recipe I have made them and there beautiful.. Thanks so much. So happy to hear from you Margaret and thank you so much for your feedback. Glad you like the recipe. Hi Margaret, could you tell me the size of those baskets you got? Are they the ‘right size’? There’s nothing on the website about size. My friend Ana is going home to Australia for Christmas and she will bring them back for me if I want them. I am in Tokyo. They are the size of the gbejneit we buy from the shop. Also Elisibath there is a section there where you can ask her a Question about them. Her name is Joyce she is really helpful. She can post them to you as well. Thanks again, Margaret. I will contact her. It would be great to get the baskets before January, when Ana comes back! My baskets have arrived all the way from Australia! Thanks so much for telling me about Joyce. Waiting for the rennet tablets! Oh that is so good! Your very welcome have fun making them I know I did. I’m still eating them love em…. Hi Margaret, hope your well.. just wanting to know as I live in australia aswell but in sydney, was wondering if the website link is still available, I just clicked on it and it says error! 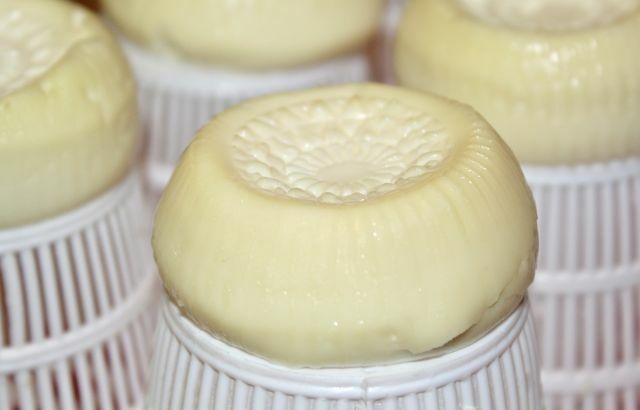 Im after getting some moulds also to try making the cheese and cant wait to give to my grandfather to try ( he is from malta). This is where I got my gbejniet forms from. The name of the lady is Joyce and the web is http://www.maltesefoods.com.au. Phone number 0407398001. Joyce includes recipe to make gbejniet in the parcel. I’m so glad that you got your gbejniet forms from Joyce. She must have forgotten to include the recipe or maybe she sent me one because I asked. I don’t remember. Sadly, I’ve only used the forms one time. I must have another go soon. I feel so spoiled living in the west of Melbourne where anything Maltese is pretty much available within a short distance. Also how do I make the liquid to store them in please? I’ll just put some vinegar and oil on them. They taste so nice.. 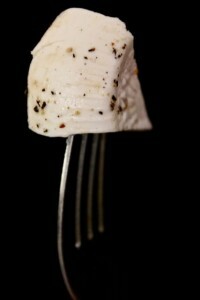 Put the dried gbejniet in an earthenware jar and sprinkle them very liberally with sea-salt and pepper. Pour over sufficient olive oil, and a little vinegar to cover them. Cover the jar until ready to eat. Use the vinegar sparingly. You do not want to produce a strong vinegary taste. Oh thank you Elisibath that’s great. I can’t believe I can make these gbejniet tal-bzar my self woohoo thanks to you.. I was born in Aussie land (Australia) I love our food and have only tasted a limited amount of for. I come from a family of 10 and my mum was 21. She didn’t have time or the money to make these things. I just wish she was alive to show her I can make these beautiful gbejniet. I was told also if you dry them enough that they are solid you can JAR THEM with a little vinegar and oil and pepper. I wonder if we could freeze them like I do at times with other cheeses!!!! I have not tried freezing them. BUT, in Malta they vacuum seal them and put them in the fridge and I think that is a great way to make sure they keep well if you have that gadget. Otherwise, I now make small quantities…like 4-6 gbejniet at a time. Can somebody tell me where I can buy rennet in powder or liquid form? I have tried a couple of pharmacies but have been told that rennet is no longer being imported which I find hard to believe. Where are you writing from Lino? Do you live in Malta? The rennet I use is in pill form. Have you asked the actual pharmacist or just the sales people, as i was told they’re the only ones that can sell them. hello Georgina, i finally got the nerve to try making the gbejniet. 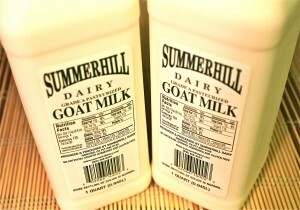 i used 3.8% Goat milk 1 litre carton, & 3tsp of Renin as a test. 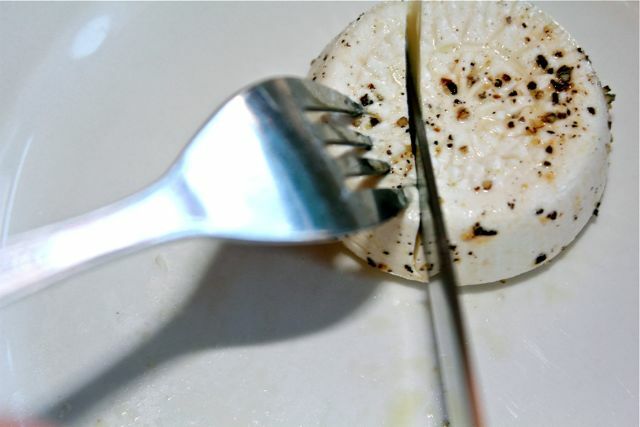 I managed to get 3 small cheeslets about 1″ high and just tried one and they seem to be good – my husband liked it and we’re still alive hahahaaa – as i was worried about food poisoning or the Renin to be too strong that it would have made us sick – BUT ya! we’re still here. Quick question, when the milk warmed up it started parting right away. I don’t have a termometer, so would you say 5mins will be enough time to make the milk warm??? I want to try them again. Okay I got it right this time with the Gbejniet! I am guessing because our Milk is not as fresh as the Maltese one we get to lose alot of the substance of the pure milk. So I tried it again and I only left the Milk warm enough to slip my little finger in it and not burn it. The texture came out better, and i manage to get 6 pieces. They are small but good and tasty. 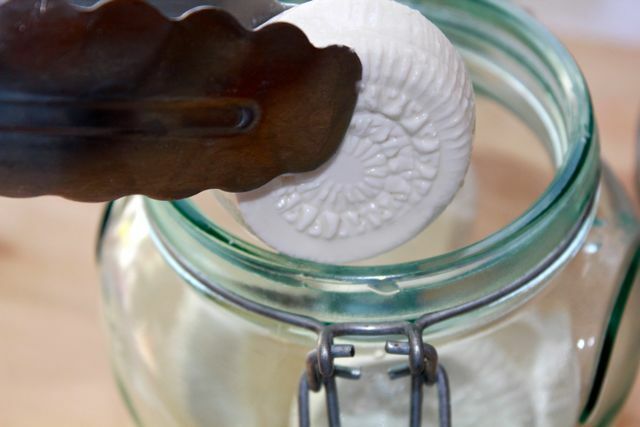 I let them dry too and place them in a jar with olive oil and a little vinegar. I’m so happy you found out a way to make it work for you Margaret. 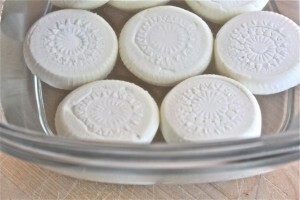 I just came back from Malta last night and I am itching to make a batch of gbejniet now. Thank you for leaving us a link to your recipes…I am going to check it out now. So excited to finally find some of my heritage recepies! I live in sub tropical climates would you suggest refrigerating the cheese while it dries or simply covered with netting should be ok? I usually let it drip for the first 2-3 days in the fridge and then let it dry au natural outside for another couple of days when it’s warm under the netting. And then store in vinegar and oil in jar in the fridge. I think in Malta they leave them at room temperature but I don’t like taking that risk. Good luck and I hope they turn out well for you. I am just in the process of making my first lot of Gbejneit & I am wondering how long they keep in the refrigerator. I’m thinking of storing them in sterilised jars with a little oil & vinegar as suggested in the recipe. However I see that someone said to cover them with oil & vinegar. Please help ! PS: Also, could someone please tell me how dry they should be before storing. Would It work if I was to use cows milk? And would it have to be full fat? I have used cow’s milk and the best I find is the full fat as it yields plumper gbejniet. You can use liquid rennet and you can find that online. I don’t know where you reside, but Walmart carry rennet as do Albertsons. I hope this helps. hi i have done the Gbejniet with normal milk full cream and fresh cream . put rennett in them too but the taste was not the same as the one we use to get in malta. I think in Malta they use sheep’s milk. Maybe that is the difference you taste? Georgina is right, the Maltese ones are done with pure sheep or goats milk. 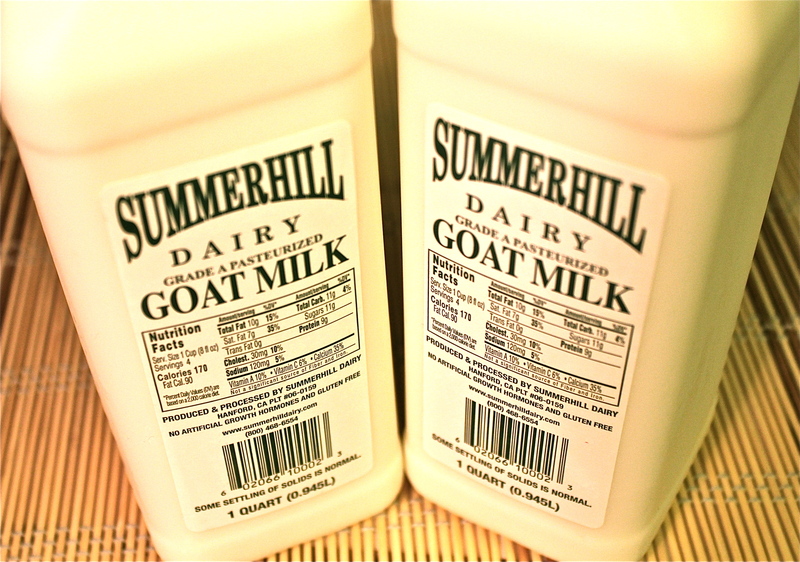 If you have a department Food Store look for Goats milk in a Litre Carton. You would need at least 3 cartons to make 8 cheeses. Always check the dates and do it right away. of course they never turn out the way the original recipe but when we are in other parts of the world it’s good to know that we have ways to make them. Everyone’s taste-buds are different so add a little salt, or pepper, maybe olive oil or balsamic vinegar when you are eating them. Hope this helped. i tryed to do the Gbejniet again and they are very salty any special salt you need to use.? I cant believe i have stumbled upon this website. 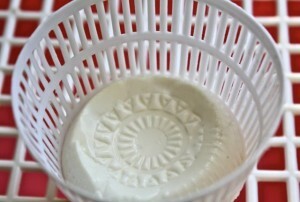 I was looking for traditional reed baskets to make maltese cheese and found the recipe as well. I have been making it for years from what my mother has told me and from what i could remember my grandmother doing on the farm. What i have been doing is spot on, just wasnt sure when pepper could be added. 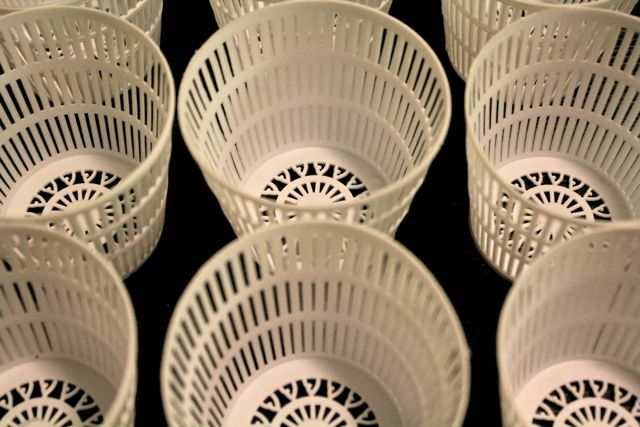 I am still using my grandmother’s reed baskets but would love more or the plastic ones pictured. Thank you for the information i am so thrilled to have found you on line. I’m making these as I’m writing this! Multi tasking hey! How long can I keep the whey for in the refrigerator? Thank you Georgina. These look like they turned out OK. I’m making kusksu tonight to go with them. It’s spring in Melbourne so broad beans can be found at the greengrocers. Stupid question: draining/dripping is done in the fridge no? I’d say they would go bad at room temperature.